Friends Don't Let Friends Drive Drunk, Do You? Chris Pierce – Consummate soul man released 60’s/Muscle Shoals vintage album “You’ve Got To Feel It!” featuring the legendary Swampers, Shoals Horns & Shoals Sisters. Co-writer of Stax jam “We Can Always Come Back To This,” featured on NBC’s “This Is Us,” charting #1 Billboard Blues, Top 20 Billboard Rock and R&B charts. Chelsea Williams – Soulful busker who found a loyal audience at Santa Monica’s Third Street Promenade with her captivating voice and intoxicating melodies, moving 100,000 copies of her three indie albums. She’s performed on the Today Show, opened for the Avett Brothers and Dwight Yoakam, and had a guest spot on a Maroon 5 video, dueting with Adam Levine on the #1 smash “Daylight (Playing For Change).” She’s been featured by Rolling Stone as 10 New Country Artists You Need To Know. Trivia: Ron Howard and Sheryl Crow bought her CD on the Promenade. Sarah Rogo – Best Singer/Songwriter nominee for the 2017 San Diego Music Awards, this old soul blues rock guitarist is a New England born, San Diego based, world class surfer who has apprenticed and toured with numerous blues greats. She is a spokesperson for National Resonator Guitar and idolizes Bonnie Raitt, Rory Black, Eva Cassidy and Dawes. She recently released “Live At Lestats West,” a collection of original songs recorded at Lestats and is working on a new album. MAWD – The moniker of California musician Madeleine Mathews, a Buzzbands LA 2018 Artist To Watch, and Live Nation’s One’s To Watch, whose eclectic sound includes indie rock, folk, folk rock, retro rock, and blues rock. The soulful, textured timbre of MAWD is diverse and ranges anywhere from a breathy sultry folk/blues vibe to a powerful Janis Joplin-esque/Karen-O belt. She’s been featured in LA Weekly, Spotify’s Fresh Minds: Six String Playlist and Indie Happy Hour’s Spotify Playlist among others. She’s signed to LA indie Soundx3. Jesse Palter – Honest, raw, confessional, organic, and real…100 percent herself. While the songwriting will remind you of Carole King and Sarah McLachlan, Jesse brings an aggressive, piano pounding pop/rock with a strength and vulnerability of Sara Bareilles. Signed to Mack Avenue Records with debut EP out this October. 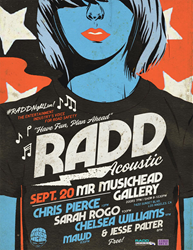 RADD® has been partnering with emerging music talent in a peer-to-peer program designed to reduce DUI arrests and fatalities, by encouraging everyone to “plan ahead” with a designated driver, ride share, uber, Lyft or taxi before heading out for the evening. RADD’s message is “have fun, plan ahead.” Drinking and driving is not an option. RADD® has partnered with KAABOO Del Mar Discovery Tour, Uber, KROQ’s Weenie Roast (radio spots), iHeart Media, Malibu Guitar Festival, Jam In The Van (Outside Lands, Coachella) and LA Crawl among others. RADD’s successful DUI Awareness campaign is on more than 53 college campuses in Southern California with a combined student population of 1,000,000, backed by a grant from the California Office Of Traffic Safety (OTS) through the National Highway Safety Administration (NHTSA/USDOT). Uber, Lyft, Taxi, Rideshare or designated driver recommended. Metered street parking available. Show: 8 p.m. – 10:30 p.m.
Free Show – 18 and over. Must show I.D.